Specially designed leg pillow fits between the knees while sleeping to relieve strain and pressure on the lower back, knees and ankles. Non-returnable. 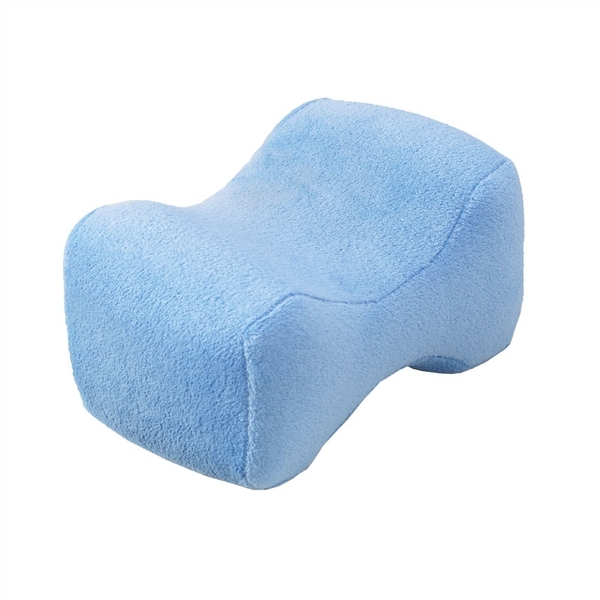 By ensuring proper hip alignment, the OPTP Contour Leg Pillow relieves stress on the body to alleviate lower back pain, knee pain and ankle pain. Its custom shape keeps the pillow in position for all-night comfort. Constructed from OPTP's premium supportive foam with a soft velour cover. Measures 8" W x 10" L x 6" H.
Comfortable, has helped with knee pain. Quality seems to be good. I am a side sleeper and quite often move my legs at night to relieve pressure from my knee resting on opposite leg. This pillow has solved that problem and is easy to keep between legs even when turning over in bed. Hips also feel more relaxed for first few steps in A.M. I love it. I have always like to sleep on my side and this pillow has helped me enjoy it even more. It fits perfectly right above the knees in between my thighs and stays in place all night. It has really help me settle into a deep sleep because my body is now aligned properly while in my favorite sleeping position! It was too wide for comfort. Made a surprising difference ! I&apos;ve used a regular pillow between my legs for years, both for back pain and hip pain. I tend to roll from side to side numerous times through the night and would awaken because the pillow got caught on the sheets etc. The contour pillow is the perfect size: stays between my legs and comes with me when I move. I have slept so much better with it from the very first night. I have been using this type of pillow for years. I cannot sleep without it. I also recommend it to my patients and no one has been disappointed! I was skeptical to try this pillow but had been told by a few friends that it really helped them so decided to try it. First night it actually hurt to use it so just used sporadically during that night. Second night was better and now it feels great and when I wake up and have so much less pain it is wonderful.